Teething can be a painful experience for babies, so many of the most common symptoms are those associated with frustration and pain. If you’re lucky and your baby doesn’t seem bothered by the sensation of teething, you may find signs are primarily visual and related to the appearance of the mouth and gums. Blood blisters on the gums. Your baby produces a lot more saliva when he or she is teething. This causes drool, and the drool can, in turn, cause a rash on the baby’s face. Swallowing the excess saliva can lead to diarrhea. Swollen lymph nodes, much like a fever, can be a reaction to teething rather than an actual illness. Blood blisters in the mouth can easily occur when teeth are erupting. Though they look alarming, they’re not a cause for concern. Teething pain can make babies extremely cranky and difficult to deal with. Fortunately, there are several things you can do to ease the pain somewhat. Try these remedies for teething pain. Rub your baby’s gums: Providing a gentle gum massage with clean hands can provide a bit of easy pressure, which will sooth some of the pain of teething. Offer a chilled teething ring: Teethers are soft items that are usually easy for your baby to grasp and put in his or her mouth. Avoid teething rings with liquid in them, as these can burst. Place teething items in the fridge before use, so they’re soothingly cool. Offer cold treats: Babies often reject foods when they’re teething, particularly those that are warm. 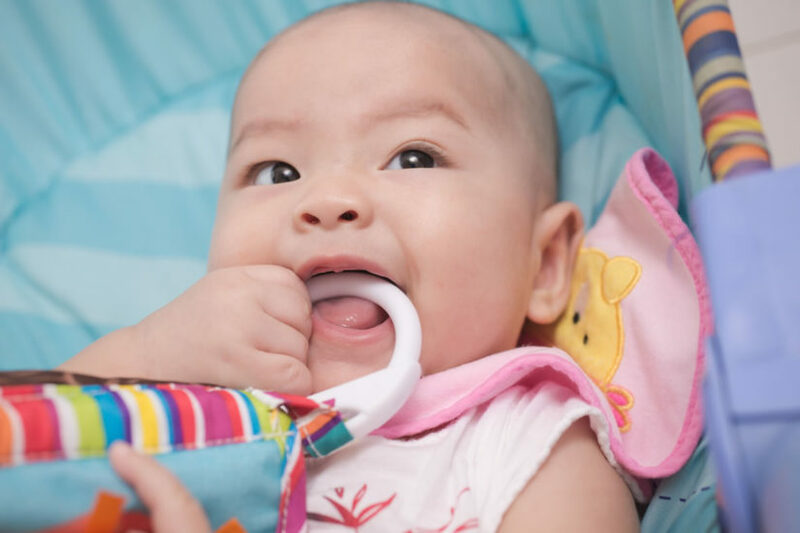 Make sure your baby is still eating while offering some teething comfort at the same time. Provide chilled foods like apples from the fridge or cold water with a little ice in the cup to ease some of the hotter pain of teething. Distract your baby: If you can’t actually stop the pain, try distracting your child from it. A new toy may do the trick. Taking a break to go to a park or another bright, interesting destination may help your baby forget about teething troubles. Other children are simply comforted by a cuddle. Drool is a natural side effect of teething, but it can present some sticky situations for parents. Keep plenty of bibs handy when your baby is teething, so you can change them often without having to change your baby’s entire outfit. Wipe your baby’s face as often as you can to try to keep it clean and dry. Persistent drool on the cheeks is what leads to that telltale rash around the mouth that can come with teething. Once that first tooth is in, it’s time to start seeing the dentist. You should typically schedule your first visit with a pediatric dentist before your child’s first birthday to make sure he or she gets comfortable with the experience early. Though these early visits should be quick and simple, it’s good to get into the habit at a young age. Teething is an inevitable part of growing up for small children, and the fussiness that comes with it is a natural rite of passage when parenting. Keep these tips and tricks in mind, so you can recognize teething when it starts and respond to it as quickly and effectively as possible. When the process is over, your tot will have a bright, beautiful smile to show off to the world.